I tried to fix an old BG 6300 as it was showing a misalignment of the LCD panels and also a massive stain appeared on the screen. After dismantling the unit with the LCD panels I found out that the glue that keeps the panels in place broke loose on all 3 panels. This must be set at the factory on a tets bench as there is no way you can align and glue them inside the projector. Anyway this problem can be fixed with a bit of trial an error so I'm not too worried. I have an other issue with one of the filter that is placed between the green light source and the LCD panel. The filter is damaged (see picture) and it can't be fixed. Does anybody know if this kind of filter can be found anywhere? I know very little about digitals, but to answer your question: I doubt it. Most of these parts are custom made for Barco, so unless you find a parts 6300, I don't think you'll find one. 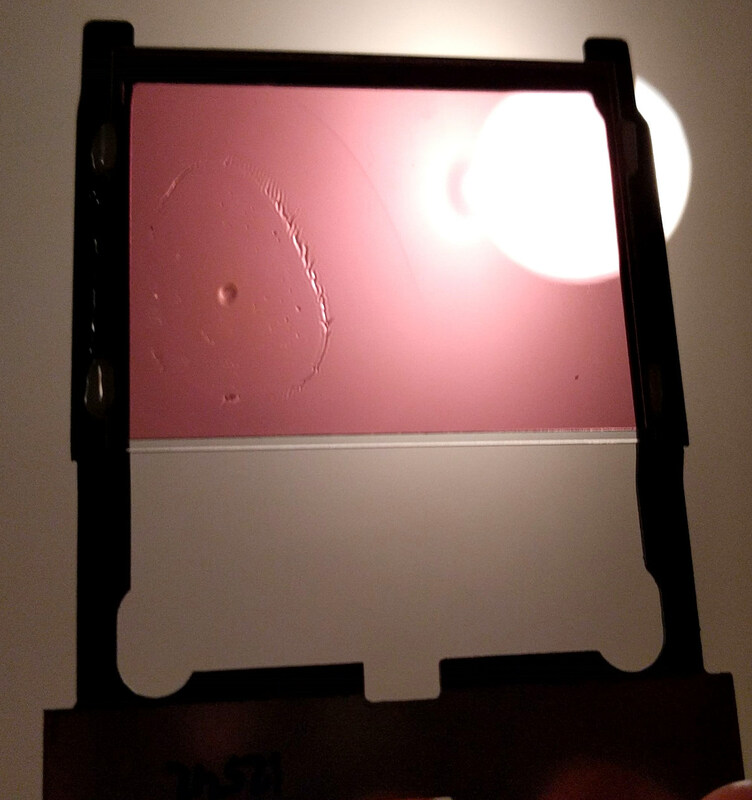 You can probably get a filter like it from a company that specializes in dichroic filters but it will probably cost you more than the entire projector is worth in perfect condition. little as 225 dollars and no takers. It's only 1024x768 resolution and the contrast ratio is not impressive at 350:1. It's a fun toy to mess with and learn from but it's not worth putting any money into it. The lens is probably worth saving. I believe the polarizers & analyzers are the same for this projector as the Barco SIM6. Do an ebay search for "Barco Polarizer" and you'll see a seller who has the blue polarizer for the SIm6 available. The sim6 uses the same chassis as the 6300 (and light engine too), so it should be a drop in replacement. This polarizer is the one that is NOT mounted to the LCD cube I assume? If it is mounted on the cube between the LCD and prism, then you need the "Barco Analyzer" which the same ebay seller also has. The part is $50 for either the analyzer or polarizer. The seller may give you a deal if you buy both, which wouldn't be a bad idea. The $50 is well worth it since the polarizers are what wear out on these models and make the image look like a pile of crap. Also, the green can be replaced with the blue, they are the same polarizer, with an ever so slightly different tint, it will not affect the color of the image at all. If they're between the LCD and prism as your post suggests, you need the analyzers. I do believe the seller has the green ones too, but they just aren't listed.